хм прикольный ящер по виду,а другие петы будут доступны в археологии? Скил-480,собрал 11 артефактов(окаменелостей) прежде,чем дали собирать этого. скил 190 ! дали собрать зависит от рендома ! могут дать когда угодно или не дать вообще ! Он еще и двухместный по ходу. Сегодня возил на нем пассажиров. Если чо, рилм - Страж Смерти. Странно, в троне приливов работало. Около Барадин Холд уже нет. Подтверждаю, как уже отмечалось в каком-то из Археологических гайдов, не любителям стиля бега Анзу сей ящер также не придется по вкусу. Уж очень сильно укачивает. Получил после создания 2х артефактов. Прокнул на скилле 266, собрал на 311. Красивый маунт, особенно красиво смотрится на андеде. Блэйзпро, Свежеватель Душ. Собрал на 275 скилле, дали сразу 15очков археологии при сборке. Дали собрать на 259 уровне скила, правдо пришлось долго бегать по локациям, чтоб собрать 100частей. Когда собрал скил уже стал 304. Прокнул где то на 450 скиле профы. Идеальный маунт для тролля ДК. Выкопал в первый же день фарма (вторым Редким артефактом, после пета ящера). Вобщем, париться не придется. На 300-ах появился. Копал только в Восточных королевствах. собрал на 525, но не потому что не везло а потому что я копаю зинрок в восточных королевствах и иногда приходится копать окаменелости. маунт весьма не плохой и добывается легко. не такой уж он редкий. собрала 3 раза, пока летала по калимдору в надеждах проков тол вирских раскопок. первый прок на скиле 100+. Подскажите, я только начал качать Археалогию, у меня вопрос, что означает "прокнул" ? Как он может прокнуть? Типо собираете по всему миру артефакты и в них попадаются рецепты на таких маунтов? Или я не так понял? Упал на СД на 310 навыке. подскажите пажалуйста на каком уровне навыка он падает? Дропнул на скилле 350-400, после 10-15 серых артефактов и 1-2 синих. Прокнул на окаменелости 0/100. После одной серой рыбы на окаменелости 35. Навык археологии во время прока Ящера составлял 73/75. Очень нравится етот маунт. Прокнул сразу после детеныша. Скажите пожалуйста его нужно сделать из артефактов (окаменелости), или он выпадает при раскопках? Создал на навыке 567... Качал археологию только второй день и тут на тебе.! Как по мне классный маунт для андедов в принципе :) Идейная вещь и смотрится лучше коняги. Прокнуло на 545, детеныша не было. Прокнул на 420! долго ловил этого маунта-наконец то! Удачи всем! Появился на 300+.. сделал скрин археологии и выложил в "изображения"
для любителей ставить минусы - вы отбиваете игрокам желание добывать этого маунта. Действительно - транспорт падает в пределе 250-600.. при условии, что вы фармите "Окаменелости"
Прокнуле на скиле 700, копал его 3 вечера. Что интересно показалось что профа теперь работает не так, как в катаклизме. Там она прокала шансом и все рандомно кому сразу кому через год. А вот щас мне все по порядку высыпало по возрастанию. Каждые артефактов 6 - 10 прокали игрушки без повторов, потом щит и потом уже ящер. Так же фармил и меч троллей, прокнуло все по порядку и меч в конце, но по времени было намного дольше. Выглядит не плохо, хотя текстурка уже старовата, менее детализированна нежели нынешние маунты особенно на тауренах и воргенах. This will be the best theme park of all time. err... on second thought maybe i shouldn't invest. someone call Dr.Grant, we have a skeletal raptor on the loose eating everyone. You know it just wants to play fetch. Requires 100 Fossil Archaeology Fragments. Is this going to be only horde, or will there be an alliance mount too? I just don't see any mounts for alliance. The displayed difficulty of 525 in wrong. I build this guy with a skill of 300. Perfect mount for Troll DKs/Warlocks? I have to have this mount. Mos Def. I wonder, if eventually, there will be one for every race. Or most races. Or anything else, really, cause hes adorable! But I'd love to see like.. a nightsaber, or pridewings, or kodos..
"Go away dog! This is my mount!" So, is the rarity of your projects/artifacts linked to your skill? Or could you get this guy as your first Fossil project at level 1? Do the dog beast/pets grab a leg or other part and run off to gnaw on it or bury it and we have to survey and refind the part to get the mount together again? That'd be interesting to do too. I was about 280 skill when this project opened up. There are four different skins for this mount, you can only get one, and the one you get is random. They are all called Fossilized Raptor. I noticed this when I was riding around on mine in SW, and someone else had another color. Technically it was a different model, it's all bones, no skin. It's all matter of luck. I got my project only at archeology lvl485 and 60+ projects done, but I know a guy who get it as a 12th project (and second fossil). So once again, it's all matter of luck. To be honest, this is fairly easy to get. Fossil only have 2 rares, so as soon as you hit 225 (I've read that's when you are able to get this) it's really only a matter of time (not that much time either, just got this at level 250). Guess this one is going to be the more common out of the 2 mounts. I really wish this was BoA. I think after doing Archaeology on one character you should be able to reap the benefits on others. Received a lot of compliments on this mount and had a lot of people asking how I got it. It didnt appear in my book until the 300s. By then I had several blue rares and kept alternating between Kalimdor & Eastern Kingdoms. Excellent looking, also goes well with the fossilized pet. Picked this up with sub-300 archaeology. A guildie got the mount at skill 268 and another guild at 305. I got mine last night after 3 hours after getting 525 in Arch. I'm still putting it together. This is really just random. Keep at it and you'll get it! I discovered this Artifact @ Level 275, although it can be discovered at any skill level because you're able to Survey for Fossil's @ skill level 1. I may have been lucky as both of my only two Rare Artifacts have both been the Fossilized Hatchling and the Fossilized Raptor. Working on this beauty on my hunter, 40/100! So happy I finally found my first rare. Working on lvl 245 out of 525! Good luck to everyone praying to get him! You know, the Fossill sites are never there when you want them! If leveling Archaeology primarily for this mount (like myself), it is advisable to not solve any Fossil fragments until you reach 225, which seems to be the minimum requirement for discovering this mount. This allows you to solve many Fossil artifacts with the chance of finding the mount as soon as you reach the required level, instead of slowly gathering enough fragments to solve Fossil finds one at a time. TL;DR - Save your Fossil fragments until 225, then solve them for many chances at finding the mount. I got this project at 495 skill level. Pretty easy to get really, I thought it would be alot harder. I know alot of this is really grindy but stick with it and the rewards will come. Got the Fossilized baby raptor at like, 150? Just got the Fossilized raptor at skill 230.
why did people down rate this when it is useful info? I just picked this up with a 152 Archeology skill. well iv'e done archaelogy on two characters to skill 525 and both of them i did get the mount before skill 300, so i think it's garanteed that you get the fossilized raptor before you reach the maximum skill of 525. Don't know if it is a bug or not. I got this at 250 well I was able to dig out the mats for it at 250 and got the mount itself at like 290. Im a bit unlucky, im at 365 point atm. I did get the hatchling done, but no raptor yet. Can fossil frags only be found in e.k. and kalimdor, or also in outland/northrend? 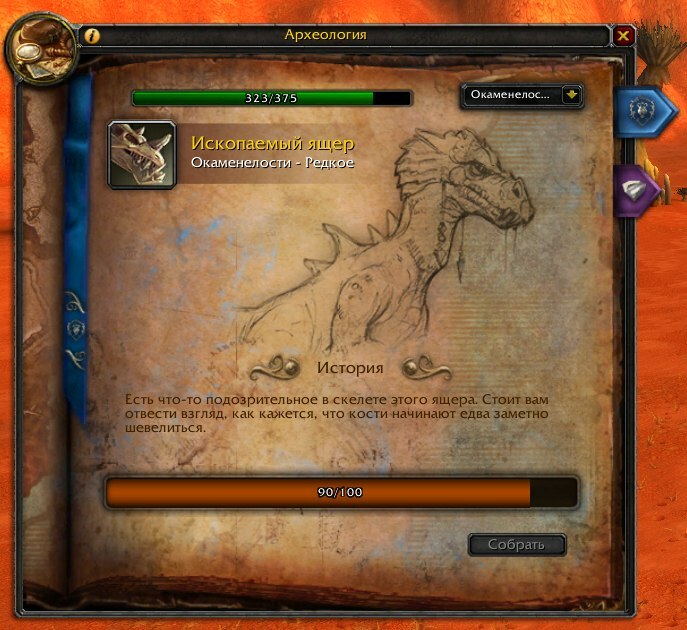 I am able to make this at lvl 260 archaeology, and here is the screen shot to prove it. GL to all mount farmers out there. "There is something unsual about these raptor bones. Whenever you look away, they seem to move slightly on their own." how do u get it what artifacts do u need to get? Discovered tonight at 253 skill, while i was making my last artifact for fossil before i discovered it i was like "I'm gonna get it..I'm gonna get it, I'm gonna get it...YYEESSS!" My understanding is that you can obtain these projects at anytime in your archaeology training. It's all random. If you pay attention to the wowhead formatting it has 525 greyed out as the difficulty. This simply means you won't gain any skill points if you complete it at 525 (which is logical since you can't ahve more than 525 points). I don't believe there is a skill requirement to create any of the projects, it's just pure luck. Happy hunting! soo i was just wondering : is it possible to get more then one of the objects between rares? kk just wondering is it possible to get more then one of each artifact between rares? Luckily, i picked this up @ 50 archeology lvl, YES 50. :)) lucky me. I got baby raptor at 160ish and this project at level 460 archelogy. Just wondering if baby raptor (hatchling) is a pre-req of commons before this mount project drops. Also noticed fossil sites coming up less and less on the map to gather these fragments not complainng just an oberservation. Only 40 more fossil fragments to go! I was able to get this at 283 skill level. I LOV U MY LITTLE RAPT! 1 thing i have noticed on doing my archy is if you gather the max amount of fragments you can get and wait to solve all 4 in one area with max on all you stand a better chance to get epic rare's. i have done this now on 2 of my characters and have gotten this along with a couple others i was after. So it is all random but seems gathering the max fragments is working out much better for me. Still havnt recieves this mount yet, I have got the pet. My archaeology has reached 525 and Im still trying to get it! I guess thats what I get for getting the sandstone drake recipe in my first jar! some nice RNG right there. i was at 429 when this thing finally popped so it is all luck. I had mine come up at skill level 375, i have one pet but still missing the Pterrordax Hatchling. Heck im at 525 and still havent gotten theis @#$%^&* mount. i finally got this at 600 skill, now i just have to complete it.. i CAN'T WAIT! Just got this Beauty in my solve tab at 600 skill level with over 30 solves and 2 of those are the pets and also got the ancient amber. This is an awesome addition to my Mount Collection and it looks really fantastic. Maxed out my archaeolgy skill to 600. After a month of digging at maxed out I finally came across this project. Some others have been lucky enough to obtain this mount at a lower skill level but I was not. To the rest of the population that is farming for this mount, Keep digging! It is out there! Best way ( I think) to go about farming for fossils is to dig only in Kalimdor and in The Eastern Kingdom. Try to dig at all the digsites that spawn on the map. The quicker you dig at the dwarven, night elf, tolvir and troll site the quicker the fossil banks will show. Собрав скелет с помощью заклятий тайной магии, вы вернули ящеру жизнь. "Легенда гласит, что ящер-охотник посмел потревожить молодую Тиранду Шелест Ветра, когда она купалась в джунглях. На зверя было наложено проклятие, и теперь он вынужден скитаться по землям Азерота, пока не извинится."